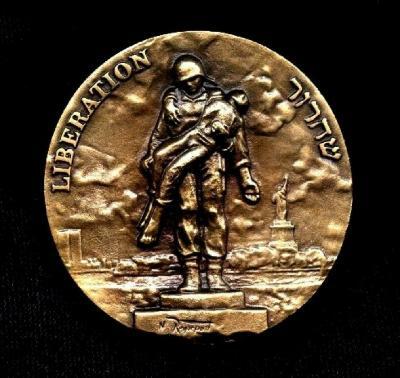 Obverse: Depicts Natan Rapoport’s Liberation monument, which stands in Liberty State Park in Jersey City, New Jersey. The monument is of an unarmed American solder (GI) standing on a pedestal, cradling a concentration camp survivor in his arms. “Our servicemen fought, not to conquer…but rather to rescue and restore freedom to those persecuted and oppressed…” these words were written in the Liberty Park Monument Committee Resolution, at the erection of the monument. In this last major work of a distinguished career, the sculptor endeavored to commemorate the spirit, dedication and compassion of the American servicemen as liberators of the oppressed. Set against the background of the Statue of Liberty and the twin towers of the World Trade Center on the near horizon, the monument asserts powerfully and tenderly that America fought for human dignity and liberty, earning the gratitude of the people they rescued and the respect of freedom loving people all over the world. This medal commemorates the 50th Anniversary of the Allied Armies liberation of the Nazi concentration camps in Europe, and the proclamation of four basic FREEDOMS as the right of all mankind: FREEDOM of speech, FREEDOM of religion, FREEDOM from fear, and FREEDOM from want. This medal is devoted to American soldiers who liberated Nazi concentration camps, honoring the fighters and survivors of the Holocaust, and the memory of the millions who were slaughtered. The medal was issued by the Israel Government Coins & Medals Corporation on the 50th anniversary of the Allied victory in World War II. Mintage: The medal was minted in silver (59 mm), 599 were struck, weighing approximately 175 grams; and in bronze (82mm) 999 were struck, weighing 340 grams. Mint: It is the first medal ever created by the Israel Government Coins & medals Corporation using the casting method, which produces precise sculptural high relief details.